We have oft mentioned how much we enjoy meeting new folks and bringing their music to our listening audience. Today, we have the pleasure of welcoming Matt Shepherd of The Omega Core to our family of artists, with his fascinating release Massive Black. We find it difficult to categorize this captivating album. Certainly much of the music could be labeled dark ambient, replete with foreboding abstract sound sculpture and baleful waves of texture crashing all around. But much more lurks in this album than darkness, including movements of beautiful melody and radiant light. Somehow Matt found a way to blend all of these disparate elements into a cohesive whole that hangs together in a truly hypnotic fashion. For this reason, we think that Massive Black will speak to lovers of many schools of ambient thought. Those who seek epic scope and haunting vistas will find much to love here. But likewise, those who eschew the darkness and instead crave concrete musical elements, even melody, will find parts of this album deeply satisfying. For our part, we find this fusion of ambient styles to be a novel and holistic form unto itself, a clever combination of pieces that yields a unity that stands firmly on its own, a whole whose value exceeds the sum of its parts. Truly well done. Matt himself describes the album thus: "Being a fan of drone, and huge, dreamy soundscapes, I thought I'd have a bash at creating my own. I wanted to make something that would make my spine tingle, even after listening to it countless times during the 'inspiration' sessions. Massive Black isn't exactly that, as it's rather more abstract than I would have ultimately wanted, but an entire album full of ear-bending symphonic ambient might get a bit tiring after a while. You need to have intervals of peace and WHAM, into the climax." 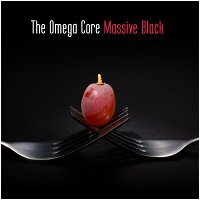 If this album weren't enough, Matt has released a great deal of other music directly through The Omega Core's web site, and we encourage our audience to not only grab Massive Black for your collections, but to investigate his other work as well. Earth Mantra is very happy to bring Massive Black to our listeners, and we certainly look forward to Matt's future releases, both via Earth Mantra and beyond. Highly recommended. A magnificent and moving opus. Excellent stuff : a magnificent sound, superb harmonies, very fluid evolution inside and between tracks...I wouldn't describe this album as really dark (in the typical "dark ambient" way), but deeply melancholic, with a perfect balance between spacey drones and moving melodies. Blown away into the next galaxy. This work is a masterpiece! It combines slightly dark tones with superb drones and very chilled-out longform open spaces. I thoroughly enjoyed listening to it. A 'must-have' for long flights, or times when you want to float off and inhabit your inner space. Great! Cool dreamy drone! Hot space ambient!